Welcome to the weekly comic review, where I take a look at the most interesting comic on the stands this week! I'm sorry for the absence of the comic review lately, I blame Digimon :P This week, I'll be taking a look at Batman/Superman #1. 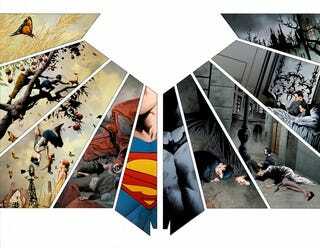 First and most importantly about Batman/Superman #1 is that it is absolutely freaking gorgeous. And I mean that, I would take panels from this comic and plaster them around my house if I could. :P I've never seen artist Jae Lee's work before and it has this dreamlike quality to it, it suits Gotham perfectly and it does wonders for Catwoman and Batman. I must say if this isn't the most beautiful comic I've seen so far this year I don't know what is! That being said he's not the only artist on this issue, which frankly is a bit of a disappointment. It makes sense plot wise, but Ben Oliver's artwork just doesn't hold up to Lee's. Now that I'm done gushing about the art of the issue let's get down to the meat of the thing shall we? The story firmly revolves around Clark and Bruce and not Supes and Bats which in my opinion is a good choice, I'd rather see more about their conflicting ideologies and why they don't get along, but still remain strong friends. Bruce here is seen as rougher around the edges than the current installment of him in the New 52, remember that this issue takes place five years before the formation of the Justice League and chronicles Batman and Superman's first meeting. Clark is seen as the paragon (heh heh) of morality. I feel that this dynamic will be what centers the series. The issue has a supernatural leaning story which in my opinion is a good thing because it differentiates itself from the dozens of other Superman or Batman titles on the shelf. (with the exception of Batwoman, she must be miffed :P) With full disclosure in mind I must say that I don't enjoy Superman as a character. He's too strong, that the stakes must be apocalyptic for them to be real for Superman. They kind of sidestep that problem in this issue, but we'll see if that holds for the series going forward. One thing that the Batman/Superman series has been known for in the past, the dual running inner monologues, return here. The thing is that Greg Pak seems to realize that they can be over used and tones it down when needed, I give him major bonus points for that. I've said this in previous reviews, but #1s tend to have an advantage in reviews because the author puts the most effort into hooking the reader in this issue. So while I enjoyed the heck out of this one we'll have to see if it continues it's strong trend. I'd give this issue an 9/10 Jae Lee's art is just too freaking good.